Confederate States of America. War Dept Regulations for the Medical Department of the C.S. Army. 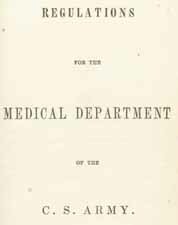 Regulations for the Medical Department of the C.S. Army. Richmond: Ritchie & Dunnavant, Printers, 1862. Confederate States of America. Army -- Medical supplies. Confederate States of America. Army -- Regulations. Confederate States of America. Army -- Sanitary affairs. Confederate States of America. Army. Medical Dept -- Rules and practice. Military hospitals -- Confederate States of America. United States -- History -- Civil War, 1861-1865 -- Equipment and supplies. United States -- History -- Civil War, 1861-1865 -- Medical care.